Type – AP entry can be one of 4 types. Vendor – Select a vendor to post to. Reference no. – Usually the vendors invoice number. Due Date – The due date for this invoice that is automatically calculated based on the terms selected above. 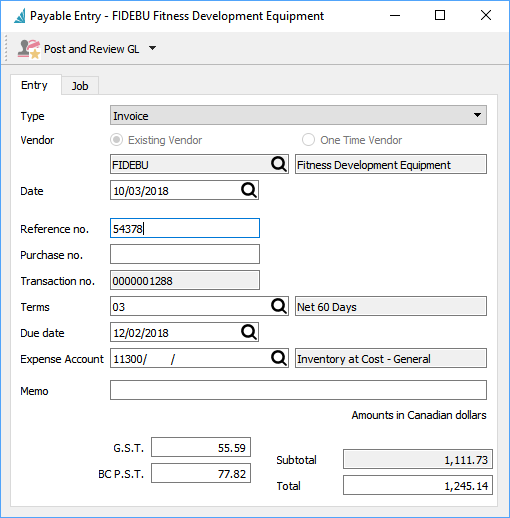 Expense Account – The default GL account that was set for this vendor. Tax1 – Tax 1 for this transaction that is automatically calculated based on how taxes are set for this vendor. Tax2 – Tax 2 for this transaction that is automatically calculated based on how taxes are set for this vendor.